Guess at some point my natural curiosity will make me pop said passport in the magic box and turn the knob. This is Skippy. Doesn't he look cute and lovable? He bites me at random, attacks other cats and kills anything that crosses his path. He's also expensive. Yet another fifty odd pounds yesterday at the vets because he's been fighting once again. I've always had cats but never before have I had an attack cat. 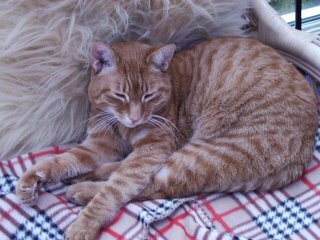 He's an RSPCA rescue cat so I don't know his background thought the vet thinks maybe his daddy was a rampaging feral! (Vet has scars also. Two nurses needed to take his temperature). But he has character...... ?? It always makes me smile whenever I have to take him to the vets and they call out 'Skippy Kennedy', its so sweet and family inclusive however its also a lesson in naming cats. A couple of years ago there was a Phil Mitchell lookalike with big shoulders, a vest and tattoos and a dear little kitten in a box waiting pateintly to be called. 'Precious Williams' the vet called and the Phil-type bloke had to answer and stand up! Fair play to him though, he grinned and carried it off with aplomb as everyone tittered. Talking about macho pre-judgements.... we stopped at the services on the M11 near Stansted airport for an early morning coffee last week at about 7am and I guess its a central shift briefing point for motorway police. As we went in there were several standing in a semi-circle as the top cop of the day gave them their instructions. Trousers in boots, stab-proof vest, grey crew-cut, all manner of objects hanging from his belt. Very Macho Marine looking. We passed by just as he said 'okay everyone, that's it. Now I'm off for some yum-yums'. YUM YUMS? Next we saw of him he was queuing for a full english breakfast! Mind you we stopped once at the services near Luton airport and there were two police officers there with guns on their belts. An everyday sight in the US but at UKmotorway services? Can't think of a quote for today as the batteries are fading in my keyboard so this has taken an age. Off to buy new ones NOW. I've always said that I must live near the sea (always have done) but Cambs is a nice county with lots of rivers. Would that do for water I ask myself.... hmmm. Not sure. But it is nice and peaceful there. Maybe maybe. We've spent so much time there lately it almost feels like home! While there we had a garage sale to dispose of some of my late brothers belongings. How hard is that to do? He was only 63 but his wife had died some years ago and they had no children so what to do with all the ornaments/books/photos/collections? As well as my own accumulated stuff (I am a hoarder) I still have a lot of the sentimental things from when my mother died a couple of years ago. If I add too much of my brothers then everything in the loft will crash down through the house and we'll all expire under the weight of crockery and photographs! Anyway, back to the garage sale. Now what an experience for a writer? such characterisation assistance! The first there, half an hour early were a retired couple in a brand spanking new people carrier. They quibbled over every pound and went away laden. He was wearing a three piece suit in nearly 80 degree of heat and sported a full set of whiskers. Then the man with the labrador. He walked into the crowded garage (big garage admittedly) with dog on lead and then said that it bites! Now did it bite? or was that his way of getting a clear path to the bargains? As everyone backed away he could view the CD's in peace. Then the woman who also looked at the CD's and announced that her husband loved Irish music. Excitedly she phoned him on his mobile and he drove over. He salivated for about half an hour and then bought four at 50p each! Great fun. Wish I didn't live on a main road with double yellows.... what a lazy way to have a clear out. Next will be the charity shop. Very guilt inducing but it has made me re-think my hoarder streak! Pleased to hear that Richard 'The Hamster' Hammond is recovering but worried that the BBC is now considering axing Top Gear. The naughty boys have been playing rough so nanny wants to take their toys away. Baaaad boys. I can think of far worse progs that should go but as I don't believe in negativity (unless its about Natwest bank) I won't say which! Bought a James Patterson book in a charity shop while there. I do enjoy his books and wish I was just a fraction as prolific as he is. This week he's number one in both the hardback abd paperback charts. Must find out how he motivated himself. Now I must try to motivate myself for an hour or so before bed! PS. Please do excuse the typos I make. I can type but I'm not a typist so sometimes they slip through. Must try harder! Quote for today........... If you can lay on the floor wthout holding on then you're not drunk. Two weeks ago I was upset by the untimely death of Crocodile Man Steve Irwin, today its the 'serious condition' of Richard Hammond from Top Gear, injured in a horrendous car crash. Richard is another 'Boys Own' character, not quite as gung ho as Steve but definitely as exuberant and as passionate about his cars as Steve was about his crocs. Never ever thought I'd become a Top Gear fan but I have. I'm about to go and buy The Thirteenth Tale by Diane Setterfield. Lots of hype and lots of good reviews. Anyone out there read it yet? There's been talk of 'twins, madness and fire', which interests me as 'My Sisters' Keeper' (my book that out before Jodi Picoults of the same title Grrrrr) covered that as well. Must check it out. Murder in Steeple Martin by Lesley Cookman. Passing Shadows by Della Galton. My website is now updated so the current newsletter is there if you want to take a look or sign up for an emailed copy. I'm not that good at regular newletters but the blog will fill the gaps! Off to watch the news to see how Richard 'the hamster' Hammond is doing. Was going to blog about my spat with Natwest bank but I'll save that while I wait for them to apologise and while I search for a polite bank! Are there any any more?? So much to do, so few people to do it for me! Just passing by in haste to mention that my latest newsletter is now up on my website so do please take a look. I'm still buried by the edits/rewrites of Past Chances but now at last it's turned the corner so I feel happy happy happy. I just love that feeling when it suddenly all comes together. It's nearly as good as typing those two wonderful words THE END. Must give the book '500 reasons why I hate the office' by Malcolm Burgess a plug as a brilliant christmas gift for anyone who works in (surprise surprise) an office! Very funny and perceptive. Malcolm B gave all the local authors so much support when he was Literary Development Officer in Essex that I have to give him a mention. Thanks Malcolm. How dare you write a good book AND leave?? The Camping Boys are home and HB is settling back into normality after a week in a teepee with no home conforts. brilliant fun apparently. Hmmmm I would sooner cut off my own arm and eat it raw than gut and cook a freshly caught, eyes wide open, mackerel. Yuk. Short and sweet today but am listing all the books I've enjoyed recently in my head as well as taking note of the TBR pile. Oh and also books by friends. So more next time. Oh Lord, if you can't make me thin, please make my friends fat. I am just so impressed with myself! I've been tinkering around with this blog and doing things I didn't think I understood but I do. Sort of. I can see how this could become as compulsive as Minesweeper. Writing news: I received an advance copy of 'Old Scores' my last book, in the large print version, published by Thorpe, which is also going to the US. Cover is completely different to the paperback but eye-catching nonetheless. Covers are such a divisive issue. Different tastes etc. also as time goes on they can start ot get dated. But Hey! just another thing to stress over and stress is what keeps us going, yes? Oh and Titles. Titles are good for stressing also. Memo to self. Learn to scan and upload then invite views. I've had a week of concentrated writing (apart from blogging) while hb and his bro have been camping in Devon in a field. Well, slightly more than a field but not a lot......... Beware Devon. Mid-age boy-scouts with Swiss Army Knives and cooking pots at large. They are loving it but as you can guess, the whole camping and caravanning thing isn't for me although I would possibly consider touring in a thirty foot (at least) Winnebago with a jacuzzi, a plasma TV and real beds. And restaurant stops. That to me is the only acceptable face of camping but you're welcome to let me know ho wrong I am! Mind you, I did compromise on a week in a log cabin in the New Forest last march. Brave huh? Shame about the relentless rain! I had my last travelling moment in June when I went off to Singapore on a nostalgic return to where I was brought up. It was so long ago (no, I'm not saying) but although lots has changed some things are still the same. Have talked about it a little on my web newsletter which should be posted shortly. Met up with an old school friend whom I've always kept in touch with and she took me here there and everywhere. I just loved it so much. Must go back soon. While there I did a book signing at Borders and was also interviewed on Channel News Asia's breakfast prog. It was v. interesting at the time and the presenter was a brilliant 'leader' but then I saw the tape! Oh my. Who was that fat old woman with frizzy hair sitting in front of me all the time? Oh whoops. It's me! And as for the photo of me with several Orang Utans at Singapore Zoo. Well! don't even go there. But I compensated by going SHOPPING which also included a new suitcase to bring the stuff home. Great fun. But of course, first I have to get this book PAST CHANCES edited and gone so I am now going back to it. Thanks friends for the comments! Up early today again to get on with editing my latest. I find editing so hard. I really enjoy writing a book from from start to finish, rampaging enthusiastically along with my imagination, but when I have to be disciplined and focused I tend to wander off to all kinds of work displacement. Catching up on out of date emails where the recipient will have long forgotten what they mailed me about. Diary of a Girl In Changi, by Sheila Allen recommended by a friend because of my connection/interest with Singapore. Fast and Louche by Jeremy Scott (also recommended) about the sixties and seventies. For fiction there are the usual favourites and friends. I love books by author friends. Lists later. As well as being a book junkie I feel I should confess to also being a news addict. Newspapers, magazines, Sky News, CNN, Fox News. When on hols in Egypt I paid £5 for the Times and £3 for the Mail because I was going crazy with nothing to feed my habit. I therefore will find it hard not to comment on various newsy news. This week I've been avidly following the backlash(?) against stingrays following the death of Steve Irwin. Now I just loved that guy, a real 'Boys Own' character, all Enid Blyton with his wide eyed 'Crikey', grazed knees and chubby thighs. You couldn't invent him without being accused of 1950's stereotyping! I was so upset when I heard the news but cutting the tails off all stingrays in retaliation? Now I know all too well that they're not the soft gentle floaty petting pets we're led to believe, I've been stung by one a great deal smaller than the one that did for Steve and it was agony, leading eventually to surgery! I maybe could have swung that particular one around by its fat, vicious, venomous tail if I'd seen it again but random mutilation of them in their own environment because one did what it was designed to do? Mind you, macho-man Texan fisherman who was watching the action when I was stung and reacting badly to the venom said he always cuts their tails off! Hmmmm. Next time.... more on books. I'm really getting into this blogging stuff so memo to self... do not be self indulgent. 'I understand the concepts of cooking and cleaning, just not how they apply to me'. Well, let's hope this works as it should do. This is my first blog and I'm carefully following a list of instructions (thank you Mandy), but if it all goes wrong then just bear with me. I've promised myself to blog at least once a week to start with, maybe more if I get up to speed? To save me doubling up on info, if you go to my website there is a pretty good outline of my life and books so far, I'll add more stuff as I go along but that's the background. As the blog is brand new I know I'm talking to myself right now so I'll keep this short and return when I can just follow on. How very exciting to be part of the big techno world that I usually seem to bypass!